The EXP Bag is your ideal travel companion. 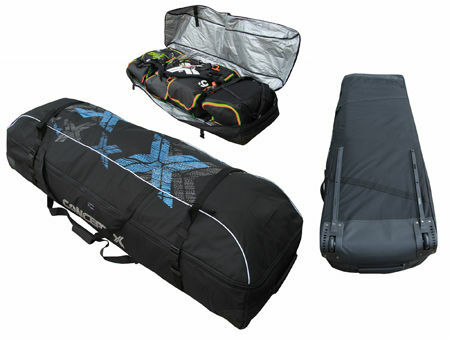 Kiteboardbag for 1-3 boards and up to max. 3-4 Kites. The Boardbag is 6mm padded and fitted with inline skate wheels for easy transport. Fully equipped with shoulder strap, compression straps and carrying handle at front and rear of the bag. One liner to protect the boards. In the back and front area the bag is reinforced with PVC for protection. Perfect for the complete equipment, fully airworthy, 40 cm high, maximum board width 48cm. Length of bords up to 144cm Best weight to the volume of the bag approx 3.95 kg. We do not renounce the necessary features of a travelbag. Reinforced PVC bottom and rails stabilize the bag.